HORIBA, Ltd. announced that, together with one of its Group companies, HORIBA Advanced Techno Co., Ltd., on February 5, 2019, it donated water quality analyzers to the Yangon City Development Committee (hereinafter, “YCDC”). Since March 2018, HORIBA has been participated in the Yangon City Sewage Treatment Plant Management and Maintenance Capacity Building Improvement Project, an international cooperation activity organized by the Japan International Cooperation Agency (hereinafter, “JICA”) under the framework of the JICA Partnership Program (JPP*1). To assist Yangon City in enhancing its capability to operate and maintain its sewage treatment plant, HORIBA has teamed up with its supporting organizations to send technical instructors to the YCDC to conduct staff training. By donating its products, HORIBA will accelerate its drive to further improve the living environment in Yangon City and achieve sustainable environmental conservation of public bodies of water there. *1 JPP: One of JICA’s ODA (Official Development Assistance) initiatives, where Japanese NGOs/CSOs, local governments, universities, private enterprises, and other organizations are invited to formulate international cooperation activities that leverage their knowledge and experiences. JICA outsources such activities to the organizations that propose them. Yangon City, the largest city of Myanmar, is planning to expand and develop its sewage treatment system in order to improve its living and water environments. In concert with the completion of this project, it is expected that a larger quantity of water will flow into the sewage treatment plant in the Central Business District, the only such facility in Yangon City, which could affect to the water quality. In 2014, the YCDC established a water testing laboratory within its sewage treatment plant, but they are now faced with a new set of challenges, including human resources development, continuous acquisition of water quality data, and further improvement of techniques to evaluate the quality of influent water and treated water. They also need to tighten wastewater quality regulations in order to prevent the inflow of substances that cannot be treated at the plant. 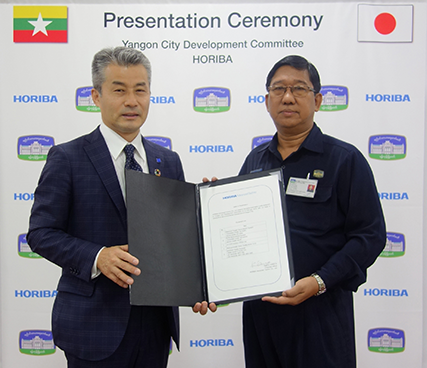 HORIBA is working with the Osaka City, which proposed the project, as well as the two supporting organizations, Hiyoshi Corporation and Clearwater OSAKA Corporation, to help the YCDC to improve the water quality and environment in Myanmar. The project began in March 2018 and is scheduled to end in May 2020. HORIBA donated its water quality analyzers to the YCDC at the Interim Report Seminar for the project held in the YCDC New Building on February 5. Around eighty people were in attendance, including YCDC Secretary Daw Hlaing Maw Oo, YCDC Water & Sanitation Department Head Aung San Win, and YCDC Water & Sanitation Department Deputy Head Thein Min. At present, we are making a master plan for the improvement of the sewage system in Myanmar through a partnership with JICA. On behalf of the people of Yangon City, I would like to show my deep appreciation for generously providing your sewage technology. We will do our utmost to effectively utilize the experience and equipment that you have bestowed upon us in Yangon City’s urban renewal. We thank JICA and private enterprises in Japan for their kind support. YCDC’s water supply business covers about 60% of residents in Yangon City. With cooperation from JICA, we are hoping to increase this number to 80% by 2025 and 100% by 2040, thus ensuring their access to safe tap water. This increase in water supply has made it imperative to treat sewage. We will utilize the knowledge that we will have gained from this project for further development. Address by Corporate Officer Koichiro Kanaya, HORIBA Advanced Techno Co., Ltd. The HORIBA Group developed Japan’s first pH meter soon after its establishment more than 65 years ago and has since contributed to environmental conservation through water quality and environmental measurements. We will make the most of our expertise as a measuring instrument manufacturer for this project. Through cooperation with concerned parties, we will continue our efforts to help the YCDC enhance its capability to maintain its sewage treatment plant.